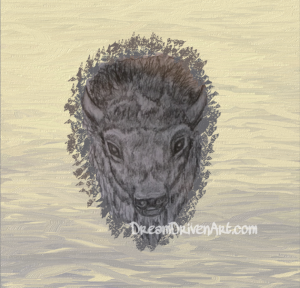 Recently, I started out drawing one of my hubby’s favorite animals…the buffalo. Well, at least it’s huge, furry head. Eventually, I’ll get around to drawing the whole animal. 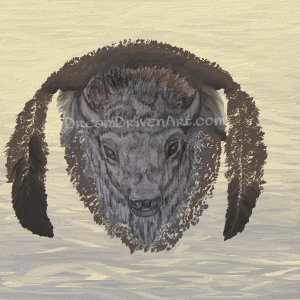 So, here it is…my first buffalo head drawing progress. but, at least it’s getting there, slowly but surely. I’ll be doing more work on this one since as you can see I need to finish the “paint” on the feathers. Again, this is all done using the Fresh Paint App, which I find pretty fun to use. Another nice thing is it’s FREE to use. Plus, if you want to, you can get some extras through the “in-app” product packs, which at the moment are only $1.49-$2.99 per pack at least as far as I looked into those. But, I cannot say how well these work since I haven’t tried them yet. 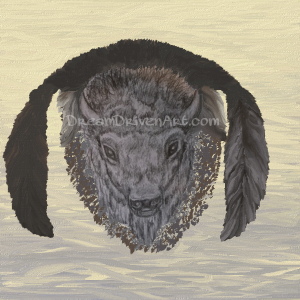 So far, I’ve been happy with what I got for free and it’s the only digital tool I’ve used on this project for painting in the background and the feathery surrounding area on the buffalo. I also add the site name URL as a watermark of sorts. To do that I use PicsArt another fun and free tool. Like Fresh Paint, this tool also has “in-app” products you might like, but are totally optional. I hope you enjoyed checking these out, and I’ll be updating this with the final images soon! 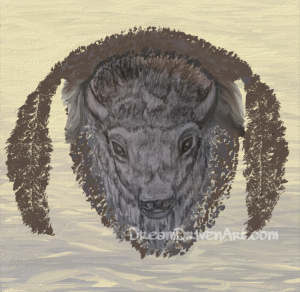 Visit Buffalo Head Drawings Part 2 to view more images of this piece…recently updated! Have you used either Fresh Paint or PicsArt? What did you think? If you have any questions or comments, let me know in the box below. I’d love to hear from you! I’m really impressed by your drawings of a buffalo. It seem so easy but I don’t think I would experience that feeling. But do you use the The Fresh Paint App? I first thought it was with a pencil. I made drawings when I was a youth and just copied another drawing. I liked especially cartoon drawings. Thanks for sharing your picture with me. Yes, I did use the Fresh Paint App for the background colors here and the feathers around the buffalo’s head. But, you are absolutely right, it started out in pencil! 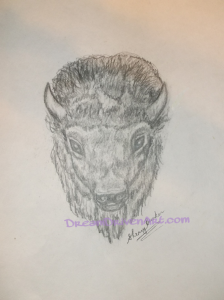 The actual buffalo head was all done in pencil first. I did the background and feathers using the Fresh Paint app after taking a photo of my drawing and uploading it to the Fresh Paint app, which is quite fun to use. It’s also free to use, so that makes it all the better. I haven’t done much in drawing cartoons…but, I’d love to do some to practice. My hubby draws cartoons once in awhile though, and I think they’re awesome, now mine on the other hand…well, I need to practice drawing cartoons more! Thanks for stopping by and commenting, Tove! I truly appreciate it! Stunning! I love art and I draw and paint quite a lot! I never thought about using an app… Tell you the truth I didn’t know they are available! Will have to give them a try. Thanks for sharing! Thank you so much for the kind words! It’s great to hear from a fellow artist…what kind of things do you draw and paint? As far as the apps, I didn’t think of it either, ’til I stumbled across them in the Apps store and seeing that they’re free I figured I’d try ’em out. I’m sure you’ll find them fun to use. I know I spent hours doodling around with them. You’ll have to let me know how they work for you once you get a chance to try them out. Thanks for stopping by and commenting…I appreciate it! Really nice artwork. I used to draw a little when I was younger, but I haven’t drawn in years. I do like how you took us through each step. Are you going to list any projects that you will be doing in the future or just post them as you start them? I think, maybe, you should start selling some of these paintings you are doing. Are you actually doing paper drawings or just app drawings? I am not too familiar with art stuff, so I am not sure how all that works. Thanks for showing us your lovely paintings. They are quite beautiful. Thank you so much for the compliment! Well, as for the future projects I hadn’t thought of doing a list before, but maybe that would be a good idea. It certainly would keep me on track better instead of wondering “what should I do next?” Great idea! I had been just posting them as I started them, but I really think you’re on to something. Yes, I do paper drawings, canvas oil paintings, colored pencil drawings along with app drawings. The buffalo here is actually a paper drawing too. But, I used the Fresh Paint app to add in the background and feathers. All you have to do is take a picture of whatever you like really and go to the “edit” function on Fresh Paint and browse through your images to add it in there. Then you can add things in with the paint function and save it back to your computer. Hope that explains it a little more… Once I learn how to do screen recordings maybe I’ll set up a “how to” video for using that app. As for selling some of these, I did set up the Prints & more page to go to where I have a few things listed already, but I need to update it soon. Thanks again for visiting and the great ideas! I haven’t used either of those applications, but they do look very cool. I really do need a tool like PicArt for my leopard gecko niche. I take a lot of my own pictures of my leopard geckos and would like to stamp my brands names on them incase people use them on their websites. However, I am using a Mac so I am not sure those two applications would work for me. Do you know if they are available on Mac? I have done a lot of business with eBay and Amazon over the last 7+ years and it might be a good idea to sign up with them and sell your digital artwork with them. It does sound like PicsArt is available for Mac after looking it up on Google. I believe you can find it here at PicsArt if you scroll down to the Google Play store or to Appleitunes buttons. I tried looking it up for tutorials on Google, but all of the ones I could find also had download links in them so I didn’t want to lead you in the wrong direction or end up sharing something that wasn’t trustworthy to download. According to most of these, you might need to also download “bluestacks app player” unless you already have it installed. It definitely is a wonderful tool to use. I use it for cropping, resizing, and adding text like shown in the images above. It also has different fonts and colors available too. I find it a very useful tool and a good way to make your own watermarks since you can adjust the opacity of the text. It takes a little getting used to at first, but I thought it’s pretty easy to use. Great suggestion about eBay and Amazon…I never thought about selling digital artwork with them before. I’ll have to check into these for sure! Thanks for stopping by and the great tips! I appreciate it very much. I really enjoyed the artwork. I used to draw a ton. I really like how you showed each step thoroughly and I had no idea the fresh paint app existed so I’ll definitely will check it out. I would really like to know what are some of your upcoming projects? Thank you for the kind comment! It’s great to hear you enjoyed the artwork. I just recently discovered the Fresh Paint app myself, so I’m still experimenting with it. But, it’s been fun to use so far. I also should’ve mentioned it’s for Windows 7 up to 10 as far as I can tell and is available on mobile devices too, but haven’t tried it on one yet. Let me know what you think of it when you do get a chance to try it out…who knows, maybe you’ll get back into drawing again with it since you can actually use it to “draw” digitally. 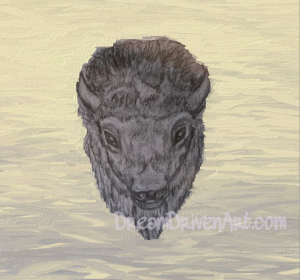 I’ve been planning on finishing a few more details on this buffalo yet, and then on to more horses and dragons, which I’ll eventually do as oil paintings. If you’ve got any suggestions for artwork ideas though, I’d love to hear ’em!